Hypertufa mixture in surgical gloves. 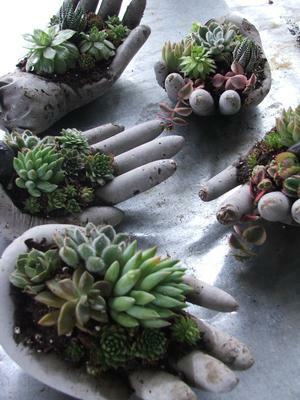 Poke holes in ends of fingers to let out air and drape palm down on top of a spray paint can ...makes good pocket for soil and gives a natural ( i think) half closed hand look. Comments for I tryed the recipe suggested for Hypertufa hands....did it!!! Those turned out fabulous! I'll be trying these too, now that the weather's warmed up. Help with removing the glove!! How do you remove the glove once it hardens? I tried it and I broke several fingers trying to remove the glove. The idea is great!! Thanks! Hi Sue, it's very tricky - you have to fully cure the hands, and if you've used the cheap latex gloves, these will eventually just shatter and fall off on their own. See more about this project on my other site here: Hypertufa Hands on Blue Fox Farm. Have fun! Need some instructions for novice gardeners. 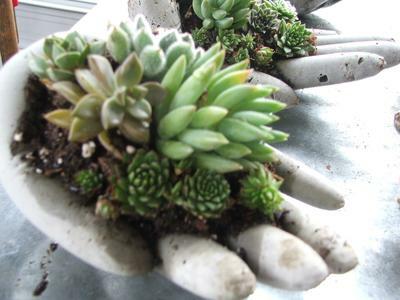 Would like to do this but can't find any instruction just looks like a painted glove with hens and chickens in it. Awesome - A+ for creativity! take small scissors and cut up from wrist along hand and along each finger. it will fall right off. you might also try putting a small fold of cardboard between the fingers so they will stay a little separate. containers that had fingernail details added. I would be really wary of adding any kind of sculpted detail - these are so fragile you wouldn't believe it. If I was trying to make fingernail detail, I would add some cut out plastic (like from a yogurt container) to the inside of the glove to test it out. Otherwise, maybe pressing carefully on the outside...thinking, and getting inspired! 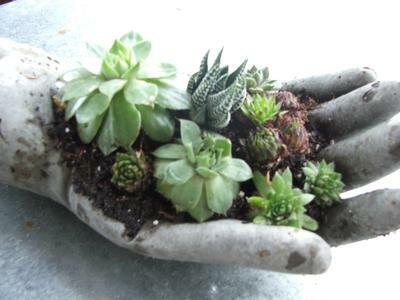 My 10 year old granddaughter and I made a hand planters from rapid set concrete. Once the concrete began to set, we pressed artificial fingernails into the fingers on the outside of the gloves to leave the nail impression. It worked great. Not sure if it would work on hypertufa hands. I have made quite a few hands and given them away as presents I found the easiest way to remove the glove after your hands are set. Before you start spray the inside of the gloves with cooking spay - works every time - make sure you rub the glove to move the spay all the way down to the fingers and the gloves just come away easy - good luck!